WHO? Aqua Sports Maui is the most successful, most recognized and least expensive Kiteboarding School on Maui and the local’s favorite. A school is only as good as it’s instructors and we have the best, check them out on Our Kiteboarding Instructor Staff Page. WHAT? Aqua Sports Maui teaches the exciting sport of kiteboarding also known as kitesurfing. Our emphasis is on safety and FUN! Check out some cool pics and vids at our Aqua Sports Maui Facebook Page. WHERE? Aqua Sports teaches at Maui’s famous “Kite Beach” in Kahului near the main airport. See our Meeting Location Page for exact directions and map. HOW? Aqua Sports instructors teach the latest and most successful kiteboarding techniques in the world. We offer personalized one on one, private kiteboarding instruction with all of the latest and best equipment included from North and Cabrinha. All instructors are certified to the highest standards, most have double certification. THERE ARE A LOT OF CHOICES, HOW DO I PICK THE RIGHT CLASS? No matter which program or hours you pick to start, be assured that you will learn what you need and will pay only for actual hours taken. You can pick any class and upgrade to a longer course at any time. Please feel free to pick an instructor for our Staff Page and take our Student/ Instructor Compatability Questionnaire. We always try to match students up with instructors that are right for them. If you have any special requests, please let us know, almost anything can be arranged. WHAT’S INCLUDED? Aqua Sports provides its customers with all kiteboarding gear, helmets, life vests, booties, rash guards, impact vests, sunscreen, water and stoke! CAN I RENT GEAR? Aqua Sports Maui also has a unique kite rental program, check it out at our Kiteboarding Rental Page. WHAT LANGUAGES DO YOU SPEAK: English, Spanish, Russian, Japanese and Canadian ? WHAT DO I NEED TO BRING? Swim suit and or boardshorts, towel, sunscreen, sunglasses and water is recommended. Girls , wear boardshorts or yoga shorts. We use seat harnesses and they have straps that go around the tops of your legs so a little padding is advised. CAN I LEARN TO KITEBOARD IN ONE LESSON? Kiteboarding is like a cross between paragliding and wake or snowboarding. One thing that is important to understand is that you will not learn to kiteboard in one day. Not to say that you can’t take a 1 day lesson if you just want to see what it is all about and you will have plenty of fun doing it. But..
First, there is a good amount to learn about safety. We feel that is very important to teach you right from the beginning how to take care of yourself. Next, learning kite control differs greatly from one person to another. Just because you excel in other sports doesn’t mean you will be the first to get kite control. I have seen 45 year old moms get it before 30 year old men. OK, usually it’s the other way around, but you will just have to take the challenge and see. It’s not hard, just different. WHERE IS YOUR STORE? 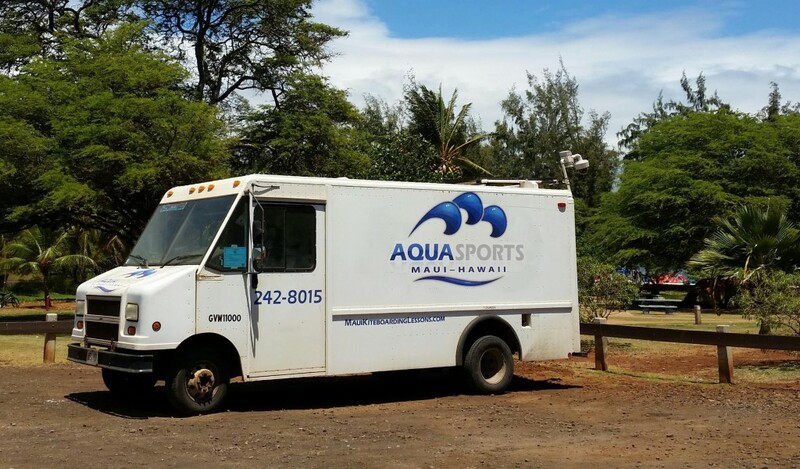 Aqua Sports Maui does not have a store, we work with several shops in town. Students enjoy discounts at more than 1 shop!